'Hard day at the office?" Luke Cage asks a beat down P.I. in search of the elusive Purple Man in the second full-length trailer for Marvel's Jessica Jones. The diminutive superhero throws back plenty of hard booze in this sneak peak at Netflix's next Marvel adventure. Jones makes it perfectly clear that she has a drinking problem. This doesn't lead to a lot of second dates. But that's okay, she has a date with destiny. And her destiny is an evil, power mad mind manipulator that goes by the name Kilgrave. In September, Netflix finally announced that its next highly-anticipated original series Marvel's Jessica Jones will premiere on November 20, 2015 at 12:01am PT in all territories where Netflix is available. That news was delivered via the show's social handle @JessicaJones. Over the course of the past two months, we've walked alongside Jessica in a number of teaser trailers. These followed Krysten Ritter's title character through a typical night out as Hell's Kitchen's most in-demand P.I. We also caught a glimpse of this unique superhero in action. After leaving a trail of battered bodies in her wake at a local dive bar, she headed off to work, where she seemed intent on solving a case that involves the elusive Purple Man. Marvel's Jessica Jones is the second of four Netflix original series', all of which are epic live-action adventures spread out over the course of the next few years. It comes after Marvel's Daredevil, which launched April 10th. Jessica Jones will then be followed by Marvel's Luke Cage and Marvel's Iron Fist sometime in 2016. This is all leading up to the teaming of the main characters in Marvel's The Defenders, to premiere only on Netflix sometime in 2018. Marvel's Daredevil is returning for Season 2 in spring 2016, and it promises to introduce Marvel comic book characters The Punisher and Elektra into the MCU. Related: How Does Captain America: Civil War Affect Marvel's Defenders? Marvel's Jessica Jones is a suspenseful, edgy look into the life of Jessica Jones, one of the most popular new Marvel characters of the last decade, as she faces demons from within and without. The drama will premiere with 13 one-hour episodes. After a tragic ending to her short-lived Super Hero stint, Jessica Jones is rebuilding her personal life and career as a detective who gets pulled into cases in New York City. Krysten Ritter (Jessica Jones) is joined by an amazing cast including David Tennant (Kilgrave), Mike Colter (Luke Cage) and Rachael Taylor (Trish Walker). Also appearing throughout the series are Carrie-Anne Moss, Eka Darville, Erin Moriarty, and Wil Traval, among others. Marvel's Jessica Jones on Netflix is Executive Produced by series Showrunner Melissa Rosenberg (Twilight, Dexter) and Liz Friedman (Elementary), along with Jeph Loeb (Marvel's Agents of S.H.I.E.L.D., Smallville, Heroes), who also serves as Marvel's Head of Television. For more information on Marvel's Jessica Jones, please visit: Netflix and the official social pages: Twitter, Facebook and Marvel. 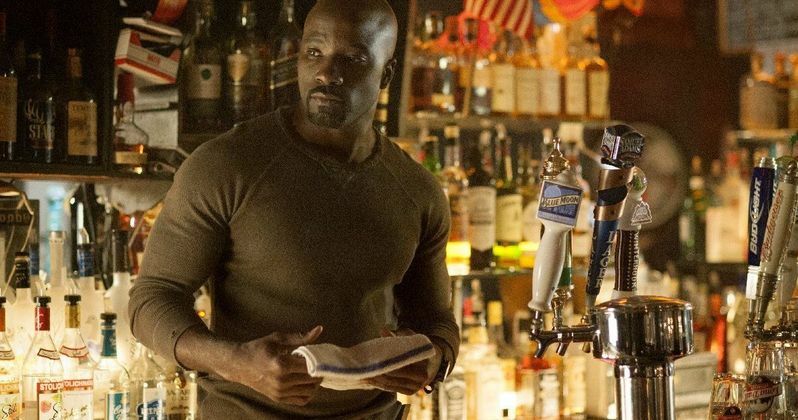 Check out the latest trailer, which has Luke Cage stepping into the fray while Jessica shows that her one true love is the Whiskey.